Go on, ya good thing! My friend Dee was cooking for about ten people last week and she was a bit stressed because she was cooking straight after a long week at work and wanted something simple yet lush. I had just tried this the night before and suggested it. She quadrupled up the ingredients and it worked a treat. This was the second time I made this Caramelised Onion and Blue Cheese pasta and it was deeeeelicious and totally simple. I bought some beautiful Gorgonzola from the Temple Bar Food Market on Saturday and made this in 15 minutes after a long Monday at work. Perfect. It’s from the BBC Good Food site. Obviously. 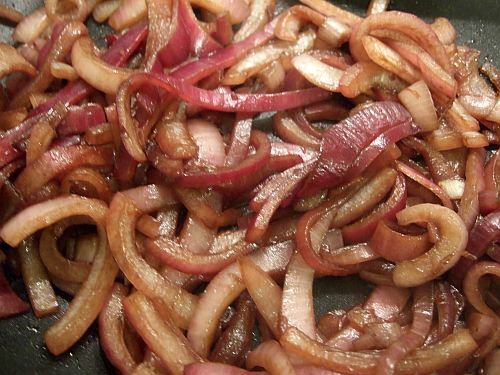 Caramelising onions sounds like it should be really difficult but it’s dead easy. 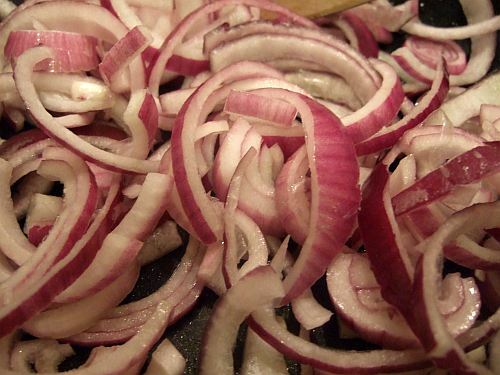 Just fry your onions in a little bit of oil for about three minutes, just to get them started a bit. Then you can add your caster sugar and balsamic vinegar and stir it all around and after a few minutes you have caramelised onions! That’s all there is to it. While your onions are caramelising (i can has word?) you’ll have your pasta cooking away as required on packet. 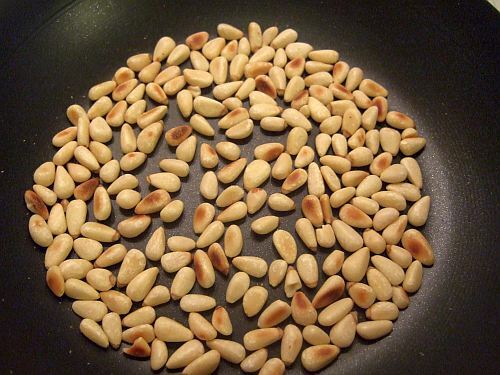 You’ll also be toasting the pine nuts – all they need is about five minutes on a dry pan over a medium heat. Just give them a shake a few times so they toast evenly. When your pasta and your onions are done, drain the pasta and put into a big bowl. Add the blue cheese which you have sliced up into little chunks and stir it through the pasta until it’s all melted and lovely and all the pasta is coated in a blue cheese sauce. 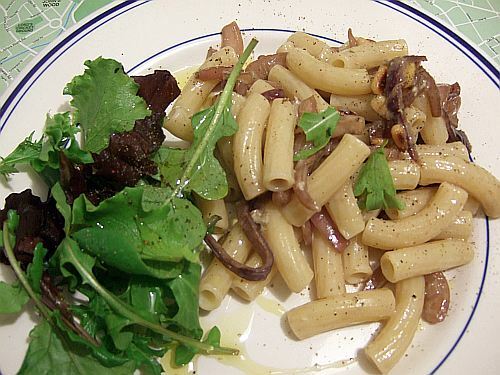 Then you stir in the caramelised onions and toasted pine nuts. And that’s you dinner! So easy! I put some rocket into ours the first time and it was lovely. Seriously, a delicious dinner that takes barely any effort to make. The only thing that you have to exert yourself for is getting the blue cheese!! And in fairness, most local shops and Spars have a bit of blue cheese so even that isn’t too hard! As I blog this, I’m listening to Niall review albums on Sinead’s afternoon show on Phantom 105.2. He’s talking about Jeffrey Lewis and he described Jeffrey’s knack for words and songwriting really well. He played a song from the new album ‘Em Are I called Whistle Past the Graveyard which is brilliant. Jeffrey is playing next week on the 29th of April in Dublin’s Crawdaddy with his band The Junkyard – I’m so looking forward to it. I saw him nearly two years ago when he was touring his last album 12 Crass songs. I won’t post any of the new tracks as it hasn’t been released yet but this is one of my favourites from 12 Crass Songs, which was a cover album of the late 70s anarcho-punk band Crass. The original lyric was “Farah Fawcett acting mean” and it’s changed to “Sarah Jessy Parker”. Go Jeffrey. Anyway, great site! I’ll keep checking in. Hi Sugarpie – thanks for stopping by! That sounds yum…would fresh rosemary work? I have a pot out on the balcony that needs using! I *heart* Well Done Fillet, he’s brillers. I bet it would work even better than the dried! I just may have this for dinner tomorrow night. Thanks for the reminder! Oooh! I’m all about redonkulously simple, crazy yummy pasta! Score! Hey OLPF (my new name for you ) such a simple yummy pasta, really filling and delicious, makes your heart feel good! Hey Spud – it is great indeed. 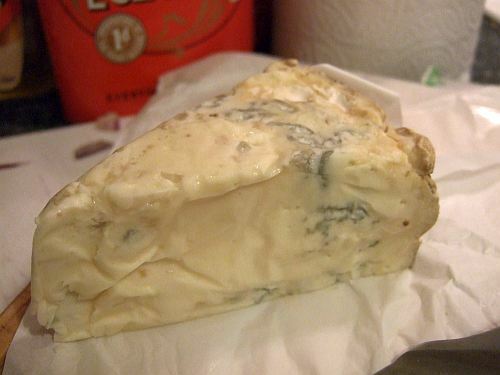 I got some lovely creamy gorgonzola in Fallon & Byrne’s a few weeks back and the one up above was more bluey and strong from Sheridan’s stall in the TB food market. One of my favourite snacks is a bit of nice brown bread toasted with sweet red pepper relish, crumbly cashel blue cheese, rocket and a slice or two of a hoige big beef tomato. *sssllobbberrrrr* Yum!